North Korea is not afraid of reprisals or isolations, much less Western threats. To prove it, Kim Jong-Un's regime did a new ballistic test last Wednesday, launching a new intercontinental missile (ICBM), which experts have called "the greatest technological advance" until the moment and, therefore, the greatest threat. 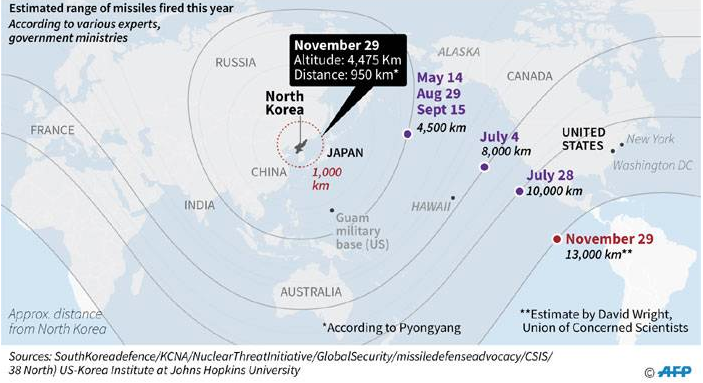 According to the North Korean media, the missile could "reach any point in US territory" and the regime declared itself "a complete nuclear state". Fulfilling their threats, the Jong-Un government declared in a national address that it had achieved "the great historical cause of completing a nuclear state force," according to The Guardian. The launch was personally supervised by the nation's leader in the Pyongsong region - 18 miles north of the capital - and 24 hours later he made public the images of the missile, its launch and its specifications. According to the data offered, the missile called Hwasong-15 could charge a "super-heavy nuclear warhead" and is the largest ever produced. According to Jeffrey Lewis, an analyst at the Middlebury Institute of International Studies, the device would have two engines capable of transporting between 80 and 100 tons; would have reached an altitude of 2,780 miles - 8,100 if its trajectory had been straight - and could easily reach Washington D.C.
Before the tacit threat, the United States ambassador to the United Nations, Nikki Haley, assured that the ballistics test of North Korea "brings the world closer to war, not farther from it”. In a statement with some historical blunders, Haley said that "We have never sought war with North Korea, and still today we do not seek it. If war does come, it will be because of continued acts of aggression like we witnessed yesterday," she said. "And if war comes, make no mistake, the North Korean regime will be utterly destroyed." Although the new design of the missile has some improvements in its structure, several specialists assured through Twitter that the model resembles the American Titan II, designed during the Cold War and retired in 1987. “The Titan II was the largest and heaviest missile ever built by the US, and was capable of carrying a 9-megaton nuclear warhead 15,000 kilometers (9,320 miles), the largest ever fielded by the US, with an explosive yield 600 times that of the bomb dropped on Hiroshima,” CNN said. While waiting for new weapons tests, both South Korea and Japan denounced the exercises, especially because of the proximity of them to the Japanese coast. 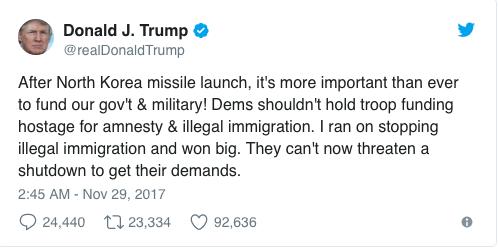 President Trump, who promised that the development of an ICBM during his presidency was impossible, assured that they would "take care" of the matter. "It is a situation that we will handle," he told reporters. But his subsequent reaction on Twitter - which seems to be closer to what he really thinks - was different. The president chose to divert the blame to the Democratic Party, to whom he attributes the obstacles of his agenda in matters of immigration and military financing. Democratic Party leaders Chuck Schumer and Nancy Pelosi have refused to support new government spending measures unless they include an agreement to protect young immigrants (Dreamers) from deportation.